Do you feel confident about your post-divorce financial future? Financial Issues Make it Harder. Going through a divorce will force you to make the biggest financial decisions of your entire life - at a time when you may feel the least capable of doing so. When you are in such extremely difficult circumstances, it is normal to question your ability to make even the smallest decisions. Or you may not be accustomed to making financial decisions. Even among the best of us, the emotionalism of divorce may cloud your good judgment. Whatever the case, you need help and you need it now. 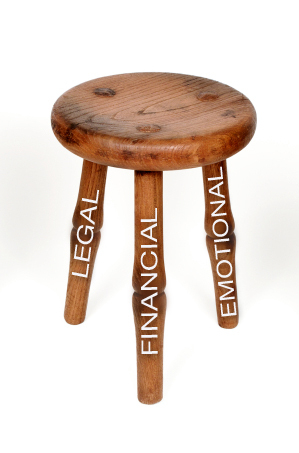 The divorce process, and the professional assistance you need, is like a three-legged stool. You need professional legal, financial, and emotional advice and support. If one of the legs is missing, just like on the stool, you will fall and get hurt. Do not expect your divorce attorney to do it all. He or she is trained in the law and is not a financial expert or a therapist. Your divorce team should include a financial professional, along with your divorce attorney and personal counselor. The best type of financial expert is an experienced financial services professional who regularly works with, and understands, the types of assets, accounts, and financial instruments you may have in your marital estate. In addition, they will have additional specialized training and certification in the divorce specialty, such as the Certified Divorce Financial Analyst (CDFA) designation. I have been recognized as the first Divorce Financial Professional in the Nation to have been awarded three different certifications in this specialty. As your divorce financial expert, I will work closely with you and your divorce attorney during the negotiation of your Marital Dissolution Agreement, or "Settlement"
Hire the Divorce Financial Planner who teaches other Divorce Financial Planners and Attorneys. As your divorce financial expert, I first look at the marital assets belonging to you and your spouse in the traditional way. Consideration is given to an itemized list of real estate owned, household goods, vehicles, debts, investments, retirement accounts and pensions, family businesses, and the like. Additionally, the income and projected living expenses for each of you will be weighed. The intent is to divide the property as equitably as possible and plan for any appropriate child and/or spousal support. But I don't stop there. I will examine the long term effects that a proposed property/support settlement has upon your future financial well-being. This is necessary because different assets, which may have equal value today, may be projected to behave differently and have vastly different values in the future. For example, a house worth $500,000, with $300,000 equity, will likely appreciate at about 1-3% per year and require maintenance and taxes to be paid in the meantime. On the other hand, a retirement account worth $300,000 may grow at about 6-8% per year and require no expenditures in the meantime. Huge difference, although today they both have the same net value and may be perceived as an equal division of property. In addition, my analysis will consider factors such as: impact of inflation upon living expenses, different tax brackets of the parties as single individuals, special tax issues specific to divorce, present value of pensions, stock options, deferred income, replacement of insurances, cost basis and performance of individual investments, alimony and child support, possible buyouts and their overall impact, and more. My additional credentials of Certified Fraud Examiner (CFE) and Master Analyst in Financial Forersics (MAFF) also enable me to identify possible indications of hidden assets or misleading documentation. A professional analysis will illustrate exactly what the impact of a proposed settlement will have upon your Cash Flow for each of the next 10, 15, or 20 years. It will also project your resulting Net Worth for each of those years. These are the things that are really important for you to maintain a dignified lifestyle. The benefit is that you will know in advance what the consequences may be of a settlement that seems equal now, but may not be at all equitable in the long run. Based upon those results, I will then develop alternative settlements for consideration by you and your divorce attorney. With the support of a divorce financial expert, you will be able to make more informed decisions regarding your divorce settlement and take better control of your financial future. Rosemary Frank is not an attorney and does not provide legal advice. ©2015 Rosemary Frank Financial, LLC Educational purposes only. No financial, legal or tax advice provided.